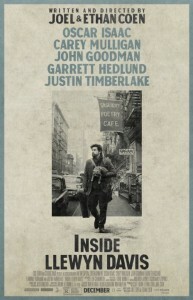 I’m not a great guy to see music biopics with, as it’s kind of like seeing a courtroom drama with a lawyer. I’m always finding all the things they’re getting wrong about a musician or band’s career, much like real lawyers can tell you why a certain defense would never fly. So when I heard the Coen Brothers were doing a movie based on Dave Van Ronk’s memoir (The Mayor of MacDougal Street, which is very good, though he didn’t finish it before his death), I was dubious. Would they really be either faithful to his story, or capture something of his spirit even if he was more a prototype for a fictional movie? Well, I’m glad to report two surprises. One was that I liked the movie a lot, though it wasn’t perfect. The second is that, though the pre-release hype I came across (which went on for quite some time) did play up the Van Ronk connection, there really isn’t too much of Van Ronk in the movie’s story or main character. The Van Ronk book (co-written by Elijah Wald) continues to be cited as a source for the film in some media reports, which I find misleading. 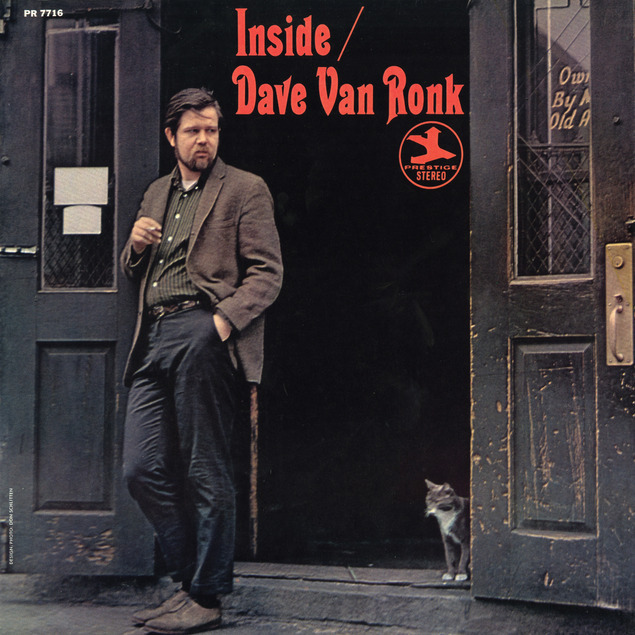 Not a rival movie or biopic, but a 1964 album by Dave Van Ronk. 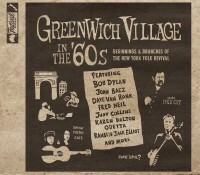 Not that I’m too annoyed; the film probably wouldn’t have been as good if it had tried to re-create the story of Van Ronk, or another early-‘60s Greenwich Village folkie. But as far as much resemblance between Van Ronk and the movie’s protagonist, let’s be serious here. 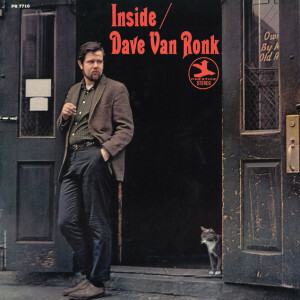 Van Ronk had a gravelly, bluesy voice that marked him as one of the earthiest and best performers in the scene. Llewyn Davis (played by Oscar Isaac) sings rather unremarkable material that’s neither as bland as the most whitebread folk revival-ish stuff nor as cutting and keening as Van Ronk (or early Bob Dylan, who’s portrayed with a cameo near the very end). Some people like his tunes in the film; I found them neither here nor there, though they were close enough to the early-‘60s folk revival sound that they fit into the storyline okay. Van Ronk (along with his wife of the time, Terri Thal) was a respected part of the scene who did his part to help other musicians, including Dylan (who took his arrangement of “House of the Rising Sun” from Van Ronk’s). Davis is on the margins, on the verge of dropping out of the profession altogether, and alienating everybody, from girlfriends and managers to family and folkies. 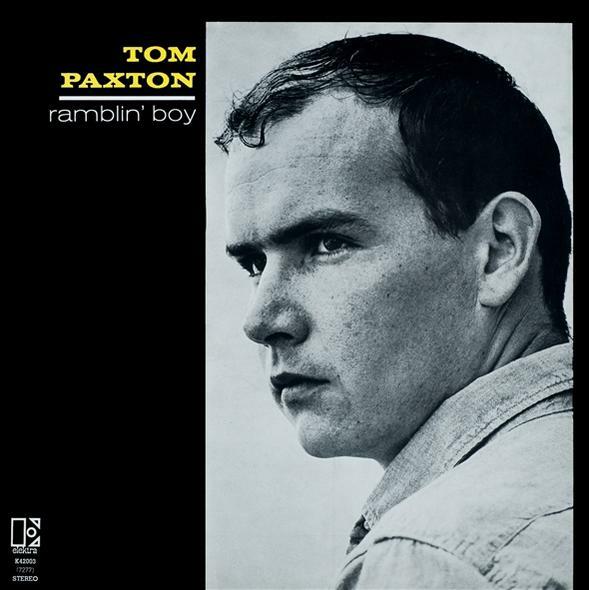 The wholesome fellow from the military who sleeps on “Jim & Jean”’s floor near the beginning seems to me based on Tom Paxton. Paxton, despite his rabid anti-war views, did serve in the military before his career took off, and has steered entirely clear of controversy since he rose to prominence as a singer-songwriter in the mid-1960s, though the “Troy Nelson” figure in the movie seems more All-American and whitebread. Getting back to “Bud Grossman,” his suggestion in the movie that Davis sing as part of a trio Grossman’s forming also has some grounding in real-life events. It took some time for Peter, Paul & Mary to solidify their personnel. Van Ronk was considered for one of the two male slots, though it’s hard to imagine him fitting into the smooth harmonies in which they specialized. So was Bob Gibson. Though Davis is a solo act in the film, it’s clear he’s recorded and performed earlier as part of a duo with another guy, now dead. There were a good if not overwhelming number of male folk duos, like Bud & Travis, Barry & Barry (one of whom was Barry McGuire of later “Eve of Destruction” fame), and (for a while) Bob Gibson and Bob Camp. 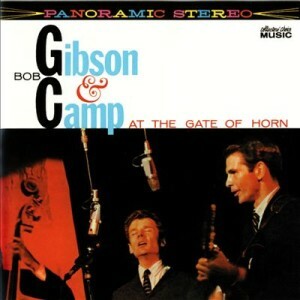 Gibson and Camp recorded a live album at the Gate of Horn, and Grossman had considered teaming them with a woman singer before Peter, Paul & Mary were finalized. “Bob Camp” later became Hamilton Camp, most known for writing and recording the original version of “Pride of Man,” later made famous in a rock version by Quicksilver Messenger Service. The smooth, urbane Columbia Records executive in the scene where Davis stumbles into a part as a session musician for the novelty “Please Mr. Kennedy” is obviously based on John Hammond. The legendary producer had played a big role in the careers of jazz giants like Billie Holiday, Charlie Christian, and Benny Goodman. He’d be the force behind signing Bob Dylan to a recording contract in late 1961, also producing Dylan’s earliest Columbia sessions. He became aware of Dylan through Bob’s participation (as harmonica player) in a session by another Columbia folk artist he was producing, Carolyn Hester. It’s not clear from the film whether Davis’s role in “Please Mr. Kennedy” will lead to a similar break, however. 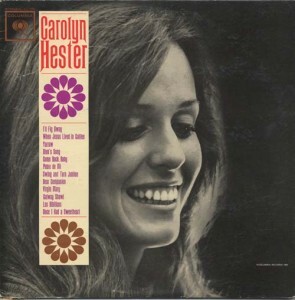 The Carolyn Hester album, with Bob Dylan on harmonica, that was produced by Columbia Records’ John Hammond, who’d soon sign Dylan. The ineffectual, elderly manager whom Davis accuses of failing to promote his career in an early scene rings true, as there were (and are) many such figures who don’t make their clients rich. One possible model is Harold Leventhal, who handled the career of Pete Seeger and the Weavers (and, later, Judy Collins and Arlo Guthrie). But he was respected, efficent, and successful, not the bumbler with the antiquated office portrayed in Inside Llewyn Davis. I’ve heard Folkways boss Moe Asch suggested as a model for this character too, but while Asch might have scraped at the financial margins of the record industry, I’d think he was much tougher and sharper. The hapless, frumpy Appalachian-type folk singer Davis heckles at a club performance could be based in part on any number of musicians who started their career before the 1960s; played a particularly reverent, striving-to-be-authentic strain of folk music; and who are rarely noted today, in part because the over-reverence of their approach has made them more dated than early Dylan (or, for that matter, Van Ronk). 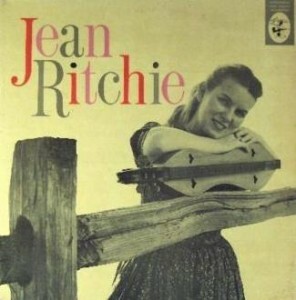 Probably the highest-profile such musician, however, was Jean Ritchie, the dulcimer player from Kentucky who made her first records in the early 1950s, and is still alive at the age of 91. Ritchie’s music might strike some as prim, but it was livelier and more dignified than what little we hear of the woman in this scene. 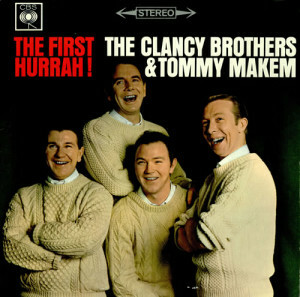 The Irish singers are, naturally, based on the Clancy Brothers & Tommy Makem, very popular Greenwich Village folk performers, and good friends of Bob Dylan. 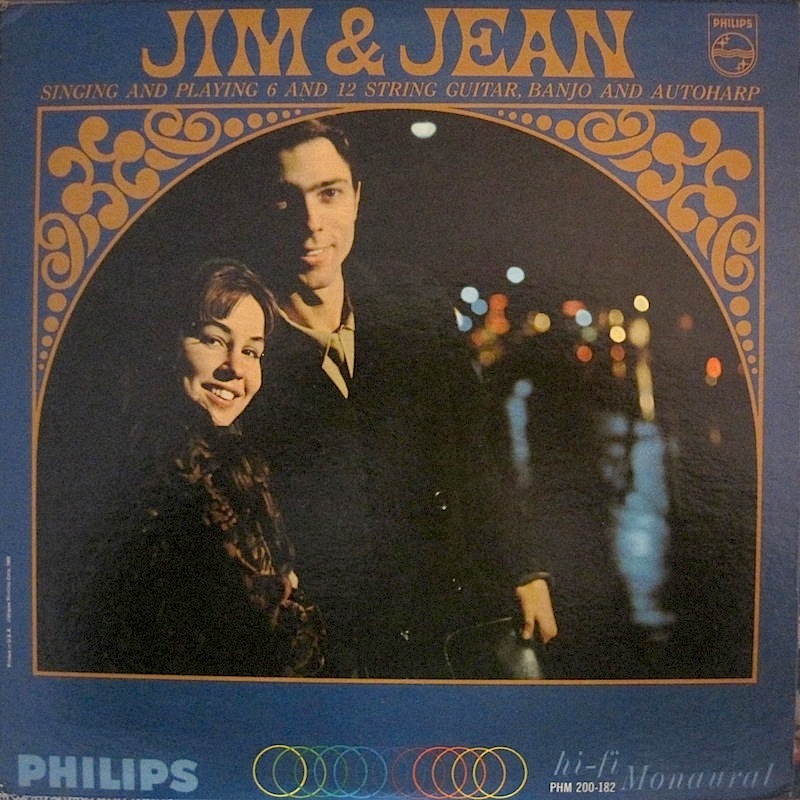 But Jim & Jean were more musically interesting than the movie, or that LP, might have you believe. Jim Glover was a close early friend of Phil Ochs, with whom he was part of a folk duo, the Sundowners, before hooking up with Jean Ray. 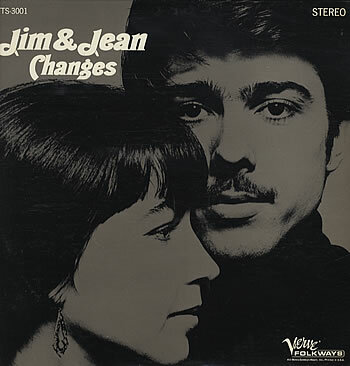 In 1966, Jim & Jean did a good early folk-rock album, Changes, with off-the-beaten-track compositions (some yet to be recorded by their authors) by Ochs, Dylan, David Blue, and Eric Andersen. After a poppier, more elaborately produced third album, they ended their career, though Jean Ray helped inspire two famous songs by Neil Young, “Cinammon Girl” and “Cowgirl in the Sand.” Full disclosure: I did the liner notes for a CD reissue combining their second and third LPs (for which I interviewed Jean Ray, who died in 2007), which can be read here. Thanks for the link to your piece on the movie. I agree with you that there are very few films about or strongly related to popular music history that seem to get the feel of the period right. Quadrophenia, not really a music docudrama but based around the Who’s rock opera, was one I thought did (though even that one had some anachronisms and mistakes). The key seems to be not trying to re-create the era or music (an impossibility), but use it as a setting for a story that will stand well on its own terms. I recently watched “Inside Llewyn Davis”, and so I felt that I was now up-to-speed on this blog post, and re-read it. This was a great rundown of the musical references in the film, some of which I caught and some I needed your blog post to understand. I think I enjoyed your blog post more than the film! The film was good, but it missed the mark for me on a couple points. 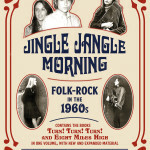 I was ready to plunge deep into the romance of the early 60’s folk scene, but didn’t get that from the film. The music was OK but again not really anything special. I realize that all of the folk scene ambiance and music was there to provide the medium for the film’s story and characters to unfold within, but it just seemed contrived. Also the cat stuff left me anxious and sad, I gotta say. Anyway, excellent work Mr. Unterberger! I wouldn’t expect any film by the Coen Brothers, however, to be especially joyous or celebratory. I kind of like having a film set in the dark side of the scene, rather than one that subscribes to the rosier retrospective images of those times. The best music of the folk revival was certainly much better than the typical music heard in the film, though I kind of liked the “Please Mr. Kennedy” satire and the Dylan character who briefly breaks out into song at the end.